Royal Enfield’s traces of foundation go back to 1893 when the company was known as Enfield Cycle Company. Enfield Cycle made its first motorcycle in 1901 and in the following years it rolled out the iconic Bullet model. To assemble Bullet locally, Redditch Company partnered with Chennai based Madras Motors and Enfield India was born. By 1962, Enfield of India acquired all the machines requisite for building components in India and began to produce all required components locally. The British origin motorcycle manufacturer is now owned by Indian automaker, Eicher Motors, the merger took place in 1994 and since then it is renamed Royal Enfield India. 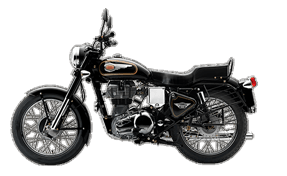 The Royal Enfield Bullet 350 is the entry level bike from Royal Enfield and the Bullet 350 is one of the oldest bikes on sale in the country. It comes with retro styling which harkens back to its roots and the retro-styled analog speedometer, key slot on the console add to the achieving this finesse on the bike. Bullet 350 has vintage look which is a USP of this bike. It has a typical circular headlight with twin pilot lamps on both sides which are beneficial for riders in the night. Bullet 350 features black coloredcircler view mirrors on its handlebar as well/ its full-size orange colors side indicators are placed on its beefy front forks. Forks in Bullet 350 are partly chromed and compliment the styling of its steel rims. Bullet 350’s fuel tank gives classic style to this drive. The things which make the Bullet 350 so special are the metallic old-school Royal Enfield emblem and hand-painted stripes on the fuel tank. It has fully chromed finished silencer as well. The rear styling of this bike features its chrome finished rear fender which displays its number plate and also carries its tail light. It has 19 inches spoke wheels as well. It has passenger footrest which makes ride comfortably for passengers as well. The front mudguard of bullet 350 clearly signifies you that this motorcycle is down to its business off being a retro machine. Bullet 350 has 4 strokes, 346cc UCE engine which gives a powerful performance for this bike. It has an air-cooled engine capable of producing a power of 19.8 bhp at 5250 rpm. Bullet 350 has chromed instrument console which gives a premium touch to this ride. It has analog instrument console which features speedometer and odometer in a circular dial surrounded by the chrome ring. Its fuel gauge is planed isjust below its speedometer with other indicators. This bike has lockable toolkit where we can put tools. It has wide seat which makes the ride comfortable for long journeys. Its handlebar gives wide chest riding posture as well. The suspension setup of front telescopic forks and rear coil springs may seem too simple and dated, but it does work wonders for this motorcycle. The Bullet 350 features retro dials for the rider along with an analog speedometer, ammeter, and a key slot on the console. It is powered by an air-cooled 346cc single-cylinder four stroke engine churning out 19.8bhp and 28Nm of torque. It is mated to a five-speed gearbox with the gear-lever on the left side of the motorcycle which gives a stylish look to the ride. Easy Transfer of No Claim Bonus (NCB), this is an easy transfer option which means that the driver is rewarded for safe driving practices and for not making a two-wheeler policy claim in the earlier year(s). Quick Registration for Online Purchase. Property damage and/or physical injury coverage in surroundings is also covered. Optional Coverage such as personal accident covers for a rider, Zero Dep cover and etc. One needs to pay an extra cost for the optional coverage.